As 2012 draft fever builds, we reach into the archives for this photo of what appears to be the winning team in one of our annual softball clashes. 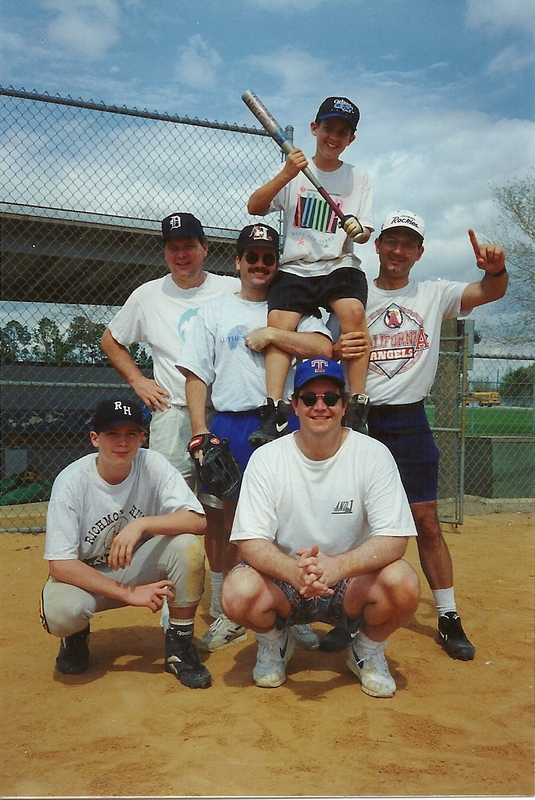 Can you name the team members — and the year??? – Dancin’ Joe Jansen – Would love to see him try that catcher’s squat these days. Musta been around 1994, that’s my guess at least. Ken Kuzdak is not pictured…. And he missed with another person pictured as well. That is a faux Ken Kuzdak. After a closer look, I stand corrected, that’s not Ken. I got confused by the Tigers hat. Must be the former manager of the Port Charlotte Pirates, good old whats-his-face. Excellent photo and what a talented softball team that is. Wonder who was responsible for drafting the squad. They probably won the I-75 title the following season. Not sure of the year, but I believe it was one of our first Royal Palm Bay drafts. I know who those six guys are but will wait to see if someone can ID them.